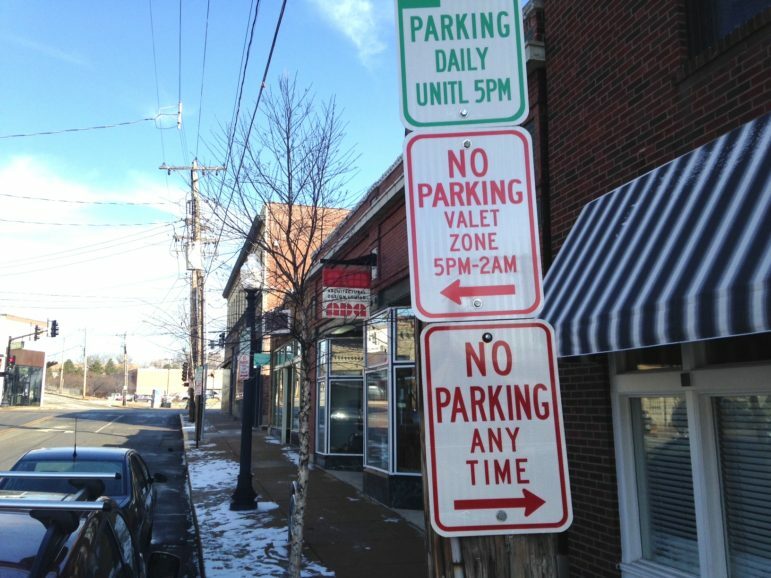 Maplewood officials at the Jan. 24 meeting considered an ordinance to approve four valet parking spots every night except Sunday from 5 p.m. to 1 a.m. on Sutton Boulevard next to the new restaurant, Elmwood. The city council amended the motion, changing four parking spots to two. Meanwhile, four parking spots were already posted. On Monday City Manager Marty Corcoran told 40 South that the signs are temporary and that the city council will make a final decision at the Feb. 12 council meeting. Javier, I realize 11.00 is about average for a cocktail drink, however, Reeds and Blue Duck’s cocktails are more substantial, taste 100% better and you get more bang for your buck. Plus, those places offer a Happy Hour. Elmwood does not. As far as the community of Maplewood, considering the median income is a little over $40,000, putting in a restaurant that will cost a family well over $100.00 does not reflect the community. Perhaps it’s more of a destination for eating, rather than neighborhood hang out. Also, by them not offering a Happy Hour for those who want to try it but cannot afford it is disappointing. I think your rude comment about me not reflecting the community was uncalled for. Besides, I think you missed my whole point about the post, which is the issue of Elmwood being allotted 2 valet spots, yet somehow they have 4. And you’re wrong about me trying to compare Elmwood and Crow’s Nest. Not once did I compare the two, as I’m well aware they are not the same type of dining experience. Happy to hear you like the Crow’s Nest. Now back to work I go. I want it to succeed, as well, but agree there is a high degree of pretension and the prices they charge do not reflect the community. The food was lackluster despite all the hullabaloo and 11.00 for a 4 oz drink is just insane. I left a review and was contacted by the owners, which I appreciated, but have not heard anything back since replying. Just seems like a lot was promised and they are not delivering. I am happy to support the other more affordable and more delicious spots in Maplewood like the Crow’s Nest and Muddled Pig. I hope the City Council does not sway on their decision to allow 2 instead of 4 spots. Seems like a bit too much, especially when there are other businesses which do not have valet spots, as well as people traveling to downtown Maplewood to enjoy multiple locations, rather than the pretentious Elmwood. Not quite sure what you mean that it doesn’t reflect the community. Maplewood is a restaurant hot spot and we have several high end places, Reeds, Benevolent King, Acero, and now Elmwood. Seems to me that Elmwood reflects the community more than you. The crow’s nest is a great place and probably my favorite restaurant in Maplewood, but you cant compare it to a place like elmwood. It’s not the same kind of thing. I would hope the cars would be parked far enough away that the normal Maplewood-parkers would not be affected. I have to say that offering valet parking and some of the menu prices go against the “no pretense” ethos one of Elmwood’s owners professed in an RFT interview last year. It seems like they aspire to be Maplewood’s fine dining flagship in the way Monarch was. I certainly want the restaurant to succeed, but Sutton was already bustling in the evening and parking at a premium. How do the other restaurants in the vicinity view this proposal? It’s not just the Sutton spots, it’s the parking spots Elmwood’s valets would use for customer’s cars. Where are those? Is there a net benefit to anyone other than Elmwood and their diners? Ate there last week. Really, really good. I recall the “no pretense comment” as well in the RFT article. Our server was super nice, but there was most certainly an air of pretension. The music, lighting, menu, drinks, everything was “Monarchesque”, which is not an insult, but is not a casual neighborhood joint either. It is def worthy of destination status, and a couple can easily drop $200 on a meal, so yeah, Maplewood should offer valet spots imho. I see in the picture above ADG may be affected by the valet….perhaps the restaurant could offer that owner a couple meals on the house to influence the decision. kidding!! No valet parking should be allowed in Maplewood. Period.